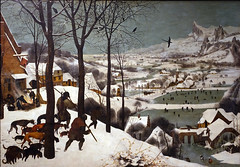 Pieter Bruegel’s Hunters in the Snow offers a bird’s eye view of a world locked in winter that is nevertheless teeming with life, with hunters and their dogs and ice skating peasants and a wheeling crow and the busied preparations for the cold weather. The painting, usually interpreted as a genre scene (an image of daily life), features a snow-covered landscape that recedes dramatically to a row of jagged mountains in the distance, all under a blue-grey sky. In the lower left corner a trio of hunters and their pack of dogs return from a hunt. Beside them is an inn, and its rust-colored bricks and the bright yellow fire in front of it are a striking contrast to the whites and grays and ashy blues that dominate the painting. The branches of three large trees in the foreground fan out like black capillaries against the sky and a few crows keep watch over the scene. From the left side of the painting the land slopes down and to the right, and beyond the foreground the landscape drops away sharply. The extensive middle ground and background, rendered in minute detail, depicts the natural and manmade world: a person carrying a load of sticks over a bridge, figures ice skating on a frozen pond, the snow-covered roofs of houses, innumerable tiny bare trees, and—far in the distance on the right side—the grey and snowy mountains, whose rough peaks seem to scratch at the sky. The right side of the painting is thus an uninterrupted view across the snowy valley. We see everything so clearly—even way into the distance it’s possible to make out individual trees and rooftops—and so we sense the crisp and clear air of a winter day. Yet this is not at all an image from reality: there is no such landscape in the Netherlands (which is mostly flat and below sea level in some areas). Rather, Bruegel combined images from his surroundings—the inns and farmhouses and frozen ponds of Northern Europe—with a chain of jagged mountains reminiscent of the Alps, which he saw on a journey to Italy in the 1550s. The painting is thus a carefully constructed scene, drawn as much from the artist’s imagination as from his surroundings. Bruegel’s paintings reward close viewing, and in some instances—like his Fall of Icarus, in which the figure of Icarus is nearly hidden in the background—careful looking is the only way to fully appreciate the complexity of the scene. This painting offers similar rewards: the longer and more attentively we examine the details the more we can draw from this image of a winter day. The hunters and their dogs are the largest figures in the painting and their group takes up much of the lower left quarter of the image. But rather than a scene of triumph, Bruegel is showing us a rather unsuccessful hunt. The men trudge through the snow wearily; note, for example, how the figure closest to us leans forward slightly, as though using his own body to keep his momentum—and his spirits—going. Each man also has his head cast downward, in a pose reminiscent of defeat. Even the dogs appear downtrodden, as several in the extreme lower left hang their heads—a point exaggerated by their drooping ears. The group’s low spirits can be explained by the fact that only one of them carries back a trophy: a rather small fox. Furthermore, a trail of rabbit tracks in front of the foremost hunter suggests that more prey have recently escaped them. Hunting rights and specially-bred hunting dogs were often associated with the aristocracy in the Northern Renaissance, and we see examples of such imagery in works like the Très Riches Heures du Duc de Berry (left), a prayer book painted by the Limbourg Brothers for the Duke of Berry, the brother of the King of France. 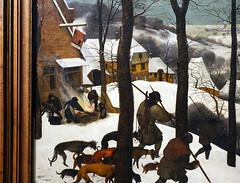 Yet in Bruegel’s painting, the identity of the hunters is not so clear, as the rest of the painting’s inhabitants are peasants, most of whom seem to be enjoying the winter day. The figures in front of the inn are preparing a fire for the singeing of a pig—a traditional December activity—and in the distance people take pleasure in the frozen lake: ice skating, playing hockey or a form of curling, and pulling companions on sleds. 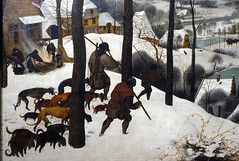 There is thus a certain idyllic quality to Bruegel’s portrayal of peasant life, and it may be that the hunters—whose bodies point us to the center of the painting—are more a means of guiding us into the painting rather than its primary focus (despite the title art historians have given the work). 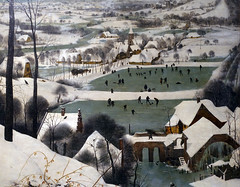 Bruegel’s painting, with its bare trees and people bundled against the cold and hard-packed snow, is part of a long tradition in Northern European art of portraying the months of the year and the activities that occurred during each month. Among the most famous examples is the cycle found in the previously mentioned Très Riches Heures du Duc de Berry (above). In that manuscript’s small but incredibly detailed paintings, each month is represented in a full-page miniature with an outdoor landscape scene (except January, which shows an indoor feasting scene) and either a courtly or peasant activity, such as hunting one month and working the land in another. In Bruegel’s case the paintings were commissioned by a wealthy Antwerp banker named Niclaes Jongelinck. Rather than twelve paintings, Bruegel’s cycle divided the year into six seasons (paintings for five survive—the other four are The Harvesters, Return of the Herd, The Gloomy Day, and Haymaking). He has also chosen to give as much or more emphasis to the landscapes than to the activities depicted, with particular attention paid to the shifting colors of the times of year, from dark brown to blues and greens to yellows. This image—of winter—is the last in the series, dominated by whites and pale blues. If we imagine how they might have been displayed together in a room in Jongelinck’s house the effect would have been a chromatic progression through the seasons. Bruegel’s focus on peasant activities in this cycle is something we might expect from him, as he is best known for his intimate, sensitive, and sometimes comical scenes of peasant life. Yet he was also a well-traveled and worldly artist who could craft complex scenes out of seemingly mundane activities. The painting’s distant mountains (below), drawn from his travels south of the Alps and so clearly a construction of the artist’s mind, are key to understanding how Bruegel has constructed the entire painting. What appears to be a candid snapshot of daily life—a cold and overcast winter day—is in fact a finely orchestrated and panoramic vision of the world. The sloping diagonals on the left—the roofs and the ground—lead our eyes into the scene, and their rhythm is countered by a series of horizontal elements—bridges and land—and the diagonals of hills and mountains on the right. The high horizon line suggests that we, the viewer, experience this scene from high above, the same perspective as might be enjoyed by the crows in the foreground trees’ branches. This type of complex view—which combines an interest in human activity with the expansive and commanding vista of a map—defines much of Bruegel’s work. His masterful ability to blend sweeping vistas with intimate portrayals of the human condition, and the mundane with the fantastical, is part of what makes his paintings—including Hunters in the Snow—so enduring. In replicating the world on a scale both large and small he seems to present a mirror to the human condition itself: continuously locked to life’s day to day activities, yet often striving to see the world in all its glory in an instant. Cite this page as: Dr. David Boffa, "Pieter Bruegel the Elder, Hunters in the Snow (Winter)," in Smarthistory, December 11, 2015, accessed April 23, 2019, https://smarthistory.org/pieter-bruegel-the-elder-hunters-in-the-snow-winter/.